I was thinking it might be cool to custom make one. 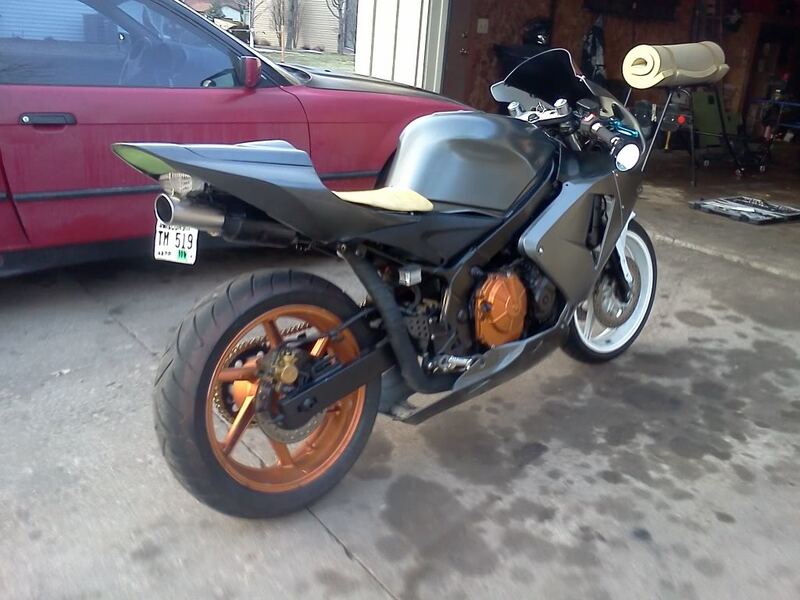 I could use some kind of heat wrap / shield to keep the heat away from the tail fairings and the seat. Opinions ? i got an f2 also and ive been thinkin the same thing. im not worried bout the heat meltin my plastics because like you said u can just use some header wrap, but where exactly would you run it. There isnt much room especially on mine cuz im dropped 2 inches. The custom welds dont bother me cuz i can weld but we need to figure out where to run it so it doesn't look worse than the factory side mount. You got that right about the Harleys & other cruisers! :O I've got a Yoshi on my F4 that is louder but not that loud. When I get behind a cruiser w/ loud pipes - they're really loud! It all comes down to stereotyping & harassment. yea my v&h is decently loud too but like you said nothin in comprison to them cruisers. my buddy w/ tha tl1000r will shoot you in tha face w/ loud raw exhaust if your to close behind him at the light. Im currently streetfightering my F3 and have made a custom tail with underseat exhaust, ive got the end can mounted up fine and that but havnt got round to mounting up the pipeing yet, need to let it warm up a bit more first as its sheet ice out there at the moment lol, the only problem i can see with running the pipeing is the batterybox is in the way and is the only plastic bit of the original tail that still exists, i'll either have to go round it making it look ugly or move the battery all together wich would be a easy option but if i move the battery ill loose the only storage space i have under the front sadle as ther is no rear saddle its a solid tail unit which could fit a battery in it but it would be a B*tch trying to get in there and hook the battery up once the tails on. i did a under tail on my f2 it looks ok in my opinion.